From 2006-2009 I was the Project Manager of the 7 Generations, Environmental Education Project. The 7 Generations course is designed to assist rural Alaskans who want to accomplish environmental planning and management using a community-based approach. The course contains valuable tools that enable communities to be more self-reliant and empowered when identifying and solving their own environmental issues. You can download the manual by clicking on the photo (PDF 34.3MB). 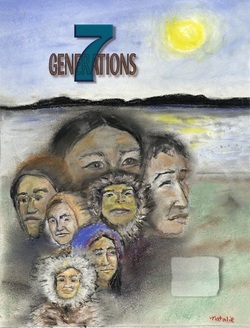 APIA offers the 7 Generations course in several Alaskan villages. If you are interested in hosting a class in your community please contact us. This course generally takes 3-4 days to complete and includes field trips (water treatment facility or landfill and one to the school, if available . The class is a lot of fun with several hands-on activities and exercises. Bruce Wright is the course instructor.